The sorry saga of the Laman St figs in Newcastle has been dragging on for years - Newcastle City Council wanted these beautiful trees, an iconic symbol of Newcastle and one of the few pretty places in the CBD, to be removed, as the story goes, in order to construct an underground carpark under Civic Park, so they rushed through a proposal to remove them based on flimsy evidence they were a danger to public safety. The many supporters of the trees, outraged such pointless environmental vandalism could take place, fought every step of the way. I was horrified by the idea - posting back in September 2010 about how beautiful the trees were, how much they meant to me, and how they must not be destroyed. Yesterday, though, it was all over. At 5am (breaking their own noise regulations), Council sent in the chainsaws, and despite furious protests apparently necessitating the presence of the riot squad, by the end of the day substantial portions of the trees had been removed. Laman St has been left scarred and ugly, but not nearly as ugly as the reaction to their removal. The comments section of the Newcastle Herald, along with threads on Facebook, was brimming with those triumphing over the loss of the trees. They could barely contain their malicious glee. "Chop chop! I'll be having drinks in the sun on Laman St tonight" crowed one idiot amongst hundreds of similar comments. "I'm sick of hearing about the figs" ran the refrain from people who felt the need to read and comment on every article about them. There were references to the waste of money - when the cheapest course of action would have been to leave the trees alone. 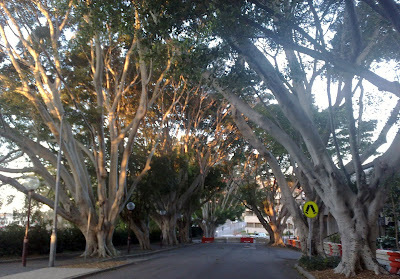 Some claimed the trees were ugly - which begs the question of why they didn't stick to the thousands of streets in Newcastle without fig trees. To judge from the quality of written expression displayed, it's not like the chop-chop brigade frequent libraries or art galleries (they can't even work out no one has used axes to fell trees in many years). There was anger at the protesters for disregarding the wishes of a democratically elected council - although the figs were never an election issue; the last council elections were in 2008 and figs were not mentioned. By the same logic I hope those who want the trees down are big carbon tax supporters. Then there was the argument that the protesters should not be hindering the tree loppers and police "just trying to do their jobs". Why is doing your job an excuse for anything? Many war crimes trials have proven that "I was just following orders" is no defence. Removing the trees is hardly on the level of a war crime, but if someone is doing something deeply wrong, in a free country we have a right to protest that. If the tree removalists had refused to cut down the trees, there would have been no problem; they didn't, they were happy to take the money to engage in this senseless vandalism; that behaviour deserves scorn not protection. Ditto the police, who could have refused to protect the tree loppers. They didn't. No one deserves to be assaulted, but standing up for what's right should take precedence over just doing your job. The police and tree loppers did not have to be there. They chose to take money to destroy the trees. Why should that be respected? Would the people who say the loppers are just doing their jobs stand aside if DoCS came to take their kids - or even merely complain if a waiter messed up their order? They're "just doing their jobs", after all. The media coverage was, I'm sad to say, highly biased, as we get to the nasty issue of the death threats. Several of the NCC councillors who voted in favour of the trees' removal reported receiving death threats - something I'm sure any decent person, and the vast majority of those who wanted the trees to stay, would abhor. But there were threats aplenty on Facebook threads of what the cop-chop brigade wanted to do to the protesters - mostly involving axes, chainsaws and teargas. The threats were pulled from Facebook as soon as they went up, but the nasty spirit remained. The act of protesting itself was decried - Australia seems to have little tolerance for anyone protesting anything; sadly we've become a nation of sit-at-home-and-whingers instead. The most heartbreaking aspect of it all was the destruction of the spirit in which the trees were planted. I'm sure those calling for the trees' removal would think of themselves as proud Australians who defend the ANZAC tradition. But the trees themselves were planted by ANZACS, returned WW1 veterans who intended them to be a living memorial to their lost brothers-in-arms. (Interesting blog post on this issue, including the original Newcastle Herald article, here). Why did we hear so little of this from the Herald today? Would it have tempered the schadenfreude of those who demanded the trees be gone? Or is even the desecration of a war memorial worth it to them for them to get their way? Those who loved the trees wanted them to stay because they are beautiful, a home for wildlife, part of the city's heritage, a living war memorial, part of personal histories and no demonstrated threat to anyone. Those who wanted them gone wished to spite the people who wanted them to stay. So who is claiming the moral high ground here? The councillors and supporters who want the figs down wanted to make Laman St as heartless and ugly as they are, and congratulations, they are succeeding. It's kinda sad to see them go. It was a lovely street, one which I had hoped to have made use of. I'd have liked to see them remain. But to nitpick over this issue because I have serious issues with minority groups acting in such a manner that it prevents governments from focusing on the more important issues. Newcstle has far bigger problems that need addressing then 14 trees. Once again we see a minority interest group, hijacking the democratic running of government. It has cost Newcastle Council a lot of money over this issue. Money that could have been better spent on more important issues. The council also has replacement trees growing down in the Central Coast that were due to be planted when this issue was first raised. This planting was/is going to be conducted in a way that prevents the trees from damaging underground pipes and cables and from reaching a height where they can become a public safety risk. It's not fair to the rate payers really that thanks to SoF the council has a 1.6m bill in legal, security, and other associated costs that should never have happened. I'm sure the town hall would have liked 1.6m spent on it's restoration. I'm sure when it is all over and done with, the new trees planted, a new art gallery built the area will look just as good if not better. At the end of the day the trees would have needing replacing in 10 or so years anyway. Might as well replace them now in line with the new gallery is done and make a beutiful area, even better that the entire region can be proud of. Council would not submit to independent assessments. It is hard to escape the notion that the trees were not being removed for entirely honest purposes. Where is the proof they were a threat to safety? As I've said, that money could have been saved by leaving the trees alone. No one mentioned them or spent money on them when I lived in Newcastle, when I first heard they were being removed I assumed they must be diseased. But no. It's all very odd. The baby figs to be planted are still only 4 metres tall. It takes decades not years for trees to mature. Sadly also I have my doubts the planting will go ahead - it is far more likely the stumps will just be left to languish for years. i think the council were wasting money and time on this issue to distract from the fact that the city is dead, and they aren't doing anything about it. every time i go to newcastle more and more buildings are being boarded up and left to rot - and the council does absolutely nothing. i think you need to live outside newcastle and visit it a few times a year to really notice this progression. now that the trees are gone, you have to wonder how the council will hide the fact that they and the local business groups aren't doing a damn thing for newcastle. personally, i think everything between stewart avenue, king street, and darby street should be completely levelled unless it has specific historic value. take a match to the whole damn thing. that's the only way to build a city people might want to visit, even live in. I've heard a theory that council dragged this out so long to get as many people as possible thinking "get it over with - get rid of the trees". If they had just removed them quietly at the time far more people would have been upset. Newcastle really is divided in two - you've got boarded up buildings on one side and on the other, every time I visit there's a massive new apartment or office block. just further demonstrates there is no cohesive town planning happening. just individual developers squeezing every cent out of individual developments, with individual people left to hope developers don't leave their neighbourhoods worse off than before. what we need is 50 years of dictatorship in newcastle to sort the place out. It's a bit more complicated then that man. It call comes back to the earthquake and closure of BHP. In the first instance many buildings were not adequetly insured against such a disaster occuring and only rudimenty superficial repairs could be carried out. Secondly due to a high water table and mining many of these properties could not be built upon higher as the cost to do so is simply not financially viable. Bit of trivia. The length of Hunter Street is longer then George Street if going from Newcastle East to just before the bridge over the rail line at Morrow Park Bowling Club. Secondly. Hundreds of industrial businesses closed due to the closure of BHP, State Dockyard, Newcastle Hospital and Pasminco. The shifting of the port from Newcastle itself to Kooragang. All of these businesses required the the support of accountants, legal firms, architects, doctors, dentists ect. These in turn supported a larger retail sector. That's a lot more office workers in the city on lunchbreak to support these retail businesses. These two significant events is what caused the decline. Newcastle's CBD in terms of land area is not that much smaller the Sydney's. I remember going into Newcastle in 1997 for a medical before I began my apprenticeship. Place was packed with people. Go in now and the place is dead. Now people are trying to fix the city. Yet what do we get? Small, generally left wing groups on the fringes dictating how things should be done. Nothing is going to be done about it whilst these groups can significantly delay and add to the cost of any rejuvenation project. Ask yourself. Would you embark on a business/development if there was a risk that it could be held up by a vocal minority? Money lenders often will pull the funding from projects at the smallest smell of contraversy because it carries risk in the sense that if they provide the lending and 6 months later everything comes to a screeching holt because of a rare bat in a tree then they lose the money they invested. Also the developer usually goes bust as well and can never again secure funding for future projects. This is the situation Newcastle finds itself in. This is why Honeysuckle has been so popular to developers as it's generally built on land built up by ballast from ships over a period of 150 odd years. It's the perfect land to build on. Try doing anything on the other side of the rail line and you might as well be that lone guy in Tianamen Square. This time the tanks are groups like SoF. People protesting against decisions is hardly antidemocratic. Ignoring those protests, sending in sneaky midnight loggers is hardly a sign of community consultation. so who is this clandestine group dictating how things should be done, and what is their deal? regardless of the history, NOW on the face of it, it looks like no one is doing anything - especially the council. Might as well engage in mass euthanasia since we're all going to die one day anyway. Do u really believe that the court cases SOF won and a two year delay was their waste of money???? If council had have been doing the right from the start there wouldn't have been court cases and a two yr delay. Council functioned on deceit. I don't call 14,000 people a minority. Get up to date. Read the metaphorical small print. I get angry with minoritylike urself who believes people should mindlessly submit to perceived powers of transient councillors who do not have the right to dictate the future of this town. Nuremberg established a precedent that, "I was only doing my job", was no defence against crimes committed, even in the theatre of war. There are more important issues than the figs, I agree. Here is a short list. 1- Transparency of council procedures. 2- Clarification on the power of the executive roles within council and its effect on councillors. 3- Proper use of Development Applications. 4- Transparency in regard to budget projections especially in regard to internal/external PR costs .... I won't go on. I will not for a second believe that this 'silly little fig issue' was a battle over some nice trees. This is a battle over letting the executives within council know who's boss. We are the public, these guys serve us. I for one will not be spoon fed by their PR machines or fall for their silly little games. Thanks for everyone's comments. 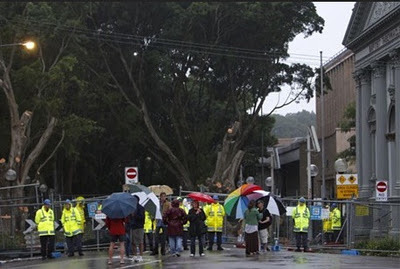 Since posting about this here I've been subjected to sustained harrassment and intimidation by supporters of the trees' removal - unprovoked (I never directly contacted any figs opponents; they showed up in their virtual droves to attack me). I'm currently seeking legal advice. I will post in days to come about all that's happened but for now I'm too exhausted and depressed by the whole thing to try. For me though I must admit it was about a few trees. Trees I've loved all my life. I still don't understand why they had to go or why a few ugly souls brayed for it so badly. Newcastle has been scarred by this in so many ways, and I really feel ashamed to be a Novocastrian right now. Council have only made the public aware of what they want the public to believe. "Those people" as council refer to SOF are those 13,00 or 14,000 people who had the courage and intelligence to challenge Council in their actions. As it turns out, council were not following correct processes. this is why felling the trees has taken over 2 years. Now the rush is on to get rid of the trees because of the change to the roads and traffic act which will impact significantly on the tree outcome. Council can try to baffle the public with legislation, arborists reports and whatever fancy terms they like. Botton line is they have been underhanded in their actions and people in Newy are not unintelligent and will make you accountable. Council is slowly destroying what was once a beautiful town. They have replaced green with Cement. Ironic how a council truck with the words "living streets" carried the wood chips away from 14 healthy fig trees. Get a grip Councillors. You are destructive men who have successfully made Newcastle an ugly place. You may think Honeysuckle is beautiful Alan, but it is an eyesore. Row after row of cement blocks called apartments, that from what I believe have been built on a water table which is already leaking in the underground car parks. Seems to me that whatever council turn their hand to is faced with destruction and gross lack of information before they act. I am ashamed to be an Novacastrian right now.